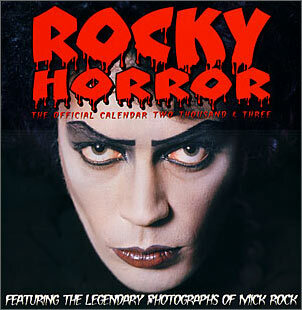 From Slow Dazzle Worldwide, based in the UK, comes the Rocky Horror Official Calendar Two Thousand & Three "Featuring the legendary photographs of Mick Rock". The calendar is very well done with each 12" x 12" (30cm x 30cm) page folding out to show the image two thirds of the height of a double page (24" x 12"), with the calendar section below. As well as the main colour photograph on each page there are some small balck and white images next to the month at the base of each page. These are the more casual snapshots from what looks like both the Picture Show as well as the original Stage production. The calendar is now available for £9.99 in most good shops or online. It is aslo very nice to see that the company will be donating a portion of the proceeds of each sale to Manchester Children's Hospital on behalf of Richard O'Brien. All images copyright Mick Rock/Slowdazzle 2002. Used for purpose of this review only and may not be copied or used on other sites.